Anti-Theft Tips For Your Motorcycle | Calgary Alarm Inc. 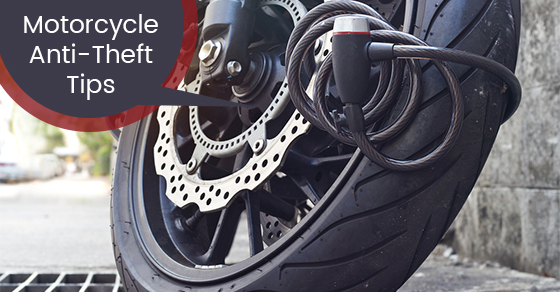 Theft is a serious issue for motorcyclists. There are two types of thieves — those who steal motorcycles on the spot because the opportunity for them to do is there or those who specifically target bikes. The problem with motorcycle theft is that bikes are typically not recovered because they are taken apart and sold for parts. Since motorcycles are such an investment, here are some anti-theft tips to protect your motorcycle. It is best to use a combination of the methods below (if not all!) to be able to protect your motorcycle. A lock with an alarm will deter thieves, especially if you make the lock very obvious. A lock and chain is often your best bet over something like a steering/fork lock. However, the key is to ensure that the lock and chain are strong enough, meaning that the thief will not likely have the tools to access your bike. A disc lock is also very effective. A kill switch makes it impossible for a thief to start or hotwire your bike, even if they have the keys. While a kill switch isn’t helpful if a thief knows how to flip the switch, a hidden one makes the process much more difficult. Since burglars have to act swiftly, a hidden kill switch can act as a deterrent. Parking is something you should take very seriously if you want to prevent your motorcycle from being stolen. When parking in public, ensure that you park in an area where a lot of people will be passing by your bike — that is, park in a high-traffic area. Ideally, you would park where you could keep an eye on it yourself, but sometimes this is not always possible. If it is not possible to park in a high-visibility area, consider parking near a security camera. Ensure that the area is well-lit. In addition, always keep your keys on you: never leave them in the ignition, even for as little as 30 seconds. When parking at home, you want to avoid making your bike highly visible. Ideally, you would store it in a locked garage. Don’t keep the keys on a peg near your bike — always keep them with you. Not only will customizing your bike improve its performance and/or comfort, but customizing your bike makes it highly identifiable, which is something thieves want to avoid. If you are customizing your bike, do ensure that you document those changes by taking photographs of it. This will come in handy to give to the police in the event that your bike is stolen.